Here’s a simple recipe for a quick bread that is moist, dense and tastes of rum and eggnog, a great holiday combo of flavors. This eggnog bread keeps well in the fridge and can also be frozen, nice to have on hand for friends dropping by during the December holidays. Today was my first experiment baking with sodium free baking powder. Many thanks to my friend, Priscilla and her heart-healthy blog, for educating me as to the high level of sodium in “regular” baking powder. I found Hain’s Baking Powder, both sodium free and gluten free, at our neighborhood Whole Foods. This stuff now has a permanent spot in my low sodium-based pantry. The recipe from the net that I based my bread on calls for a baking time of “40 to 60 minutes”. That kind of vague baking instruction drives me crazy! Who is going to look in the oven every five minutes to check for doneness? My eggnog bread was perfectly done in exactly forty minutes. TIP: Always use the tip of a sharp knife rather than a toothpick to test if a baked good is completely done. Uncooked dough does not always cling to something as thin as a toothpick. 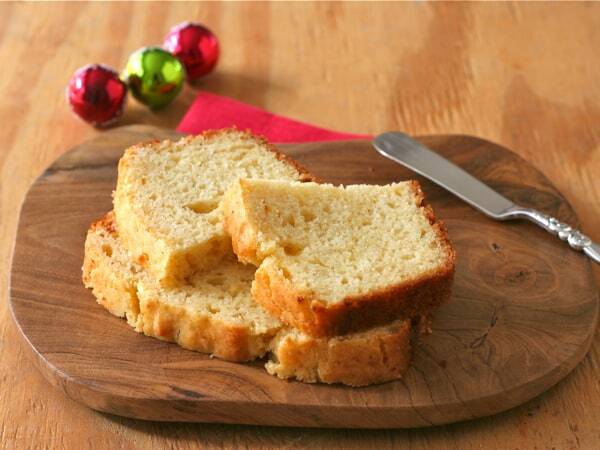 A quick bread flavored with eggnog and rum, perfect for the holidays. Butter the bottom and sides of a 9 X 5 inch-sized loaf pan. Beat together the eggs, eggnog, rum extract, sugar, vanilla and butter. Sift together the flour, baking powder, salt, nutmeg and cinnamon. Add dry ingredients to eggnog mixture, beating on low speed just until blended. Finish beating by hand to insure batter is completely mixed. Pour into greased loaf pan and bake for 40 minutes, or until tester comes out clean. Allow bread to cool for 15 minutes before removing from pan. Liz that looks fantastic, one of my favorite things around the holidays is eggnog. I can drink way too much of it. Love it in this bread. It looks incredibly moist and delicious, Happiest of Holidays to you and Larry! Thanks, Suzanne – I am an eggnog guzzler this time of year. All my best to you and yours for a happy holiday this season. Every time I see a pug, I think of you xo. This is lovely. Perfect for the holidays! Love your photo Liz, the bread looks so moist and wonderful! I adore eggnog and I am the only one in the house that does……I don’t usually treat myself, but your recipe is tempting! Treat yourself – it turned out to be a good recipe. Larry has eaten half the loaf already! Your eggnog bread sounds great! I love the idea of eggnog but struggle with the idea of raw egg so this is great for me! I did not realize there was a lot of salt in baking powder, I will have to look out for a low sodium version. We don’t eat raw eggs either, Jayne – you can order the Hain no sodium baking powder from Amazon, I think. Oh my. I really need to make this quick bread. I have a pan that’s for making tiny loaves which might be perfect for this. Really, really love. The recipe will work for three small pans, Susan.